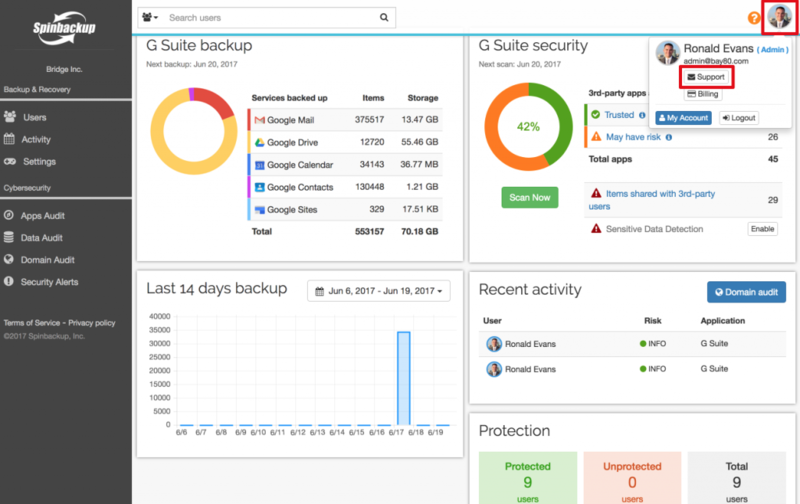 Spinbackup offers you the most affordable G Suite backup and G Suite Security pricing plans with the most convenient conditions. 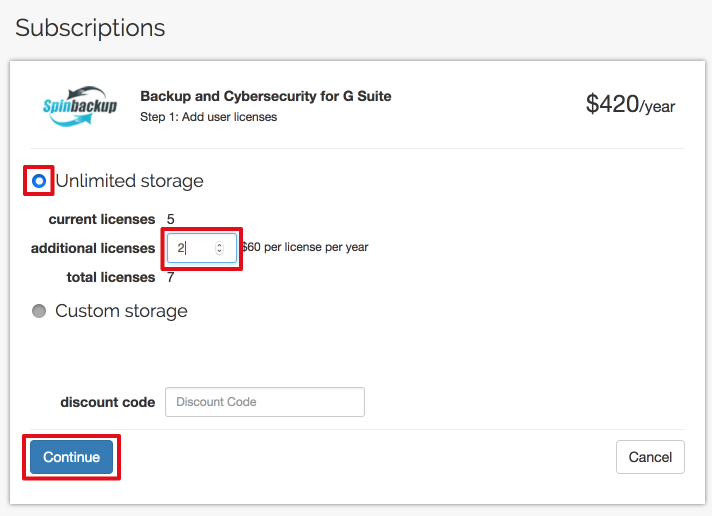 If you want to upgrade your account from a free trial to a paid version, you should select whether you need a Backup plan or G Suite Security + G Suite Backup. 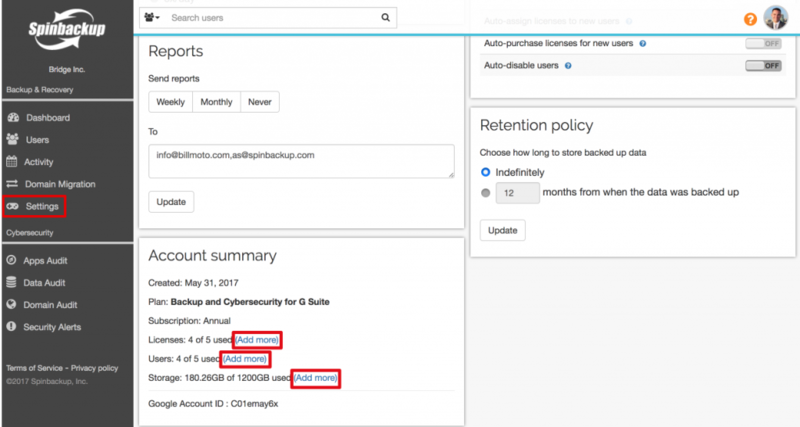 Within both of these plans you can select between Unlimited and Custom storages, Annual and Monthly subscriptions. During your 15-day trial period, you can enjoy Spinbackup features in full absolutely freely. However, if you don’t upgrade your account within this period, your automated backup and other functional will stop on the 16th day. After 15 more days your data will be completely deleted. So we strongly recommend to upgrade your account within the trial period to avoid gaps in autobackup. 1. To upgrade your account press the Upgrade Now button on the “Your Spinbackup free trial ends in … days” or “Trial is over!” yellow bar. If you don’t see the yellow bar at your dashboard, press on your photo in the upper right-hand corner and then press Billing. 2. 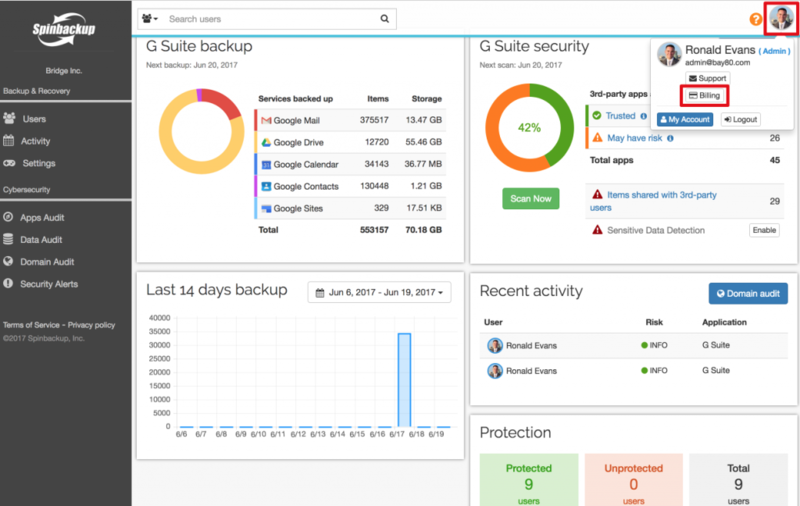 Select the plan: Backup for G Suite or Backup and G Suite Security. If you are not sure about the plan that you need, read our “5 Easy Steps to Get the Most out of Your Spinbackup Free Trial” article, to learn how to select the plan that suits your needs. After selecting the plan, press the corresponding Upgrade Now button. 3. Now you should select the storage: Unlimited or Custom. Please note: if you are going to back up Team Drives OR if your backed up data is about or more than 1TB, you should use Custom storage. 4. 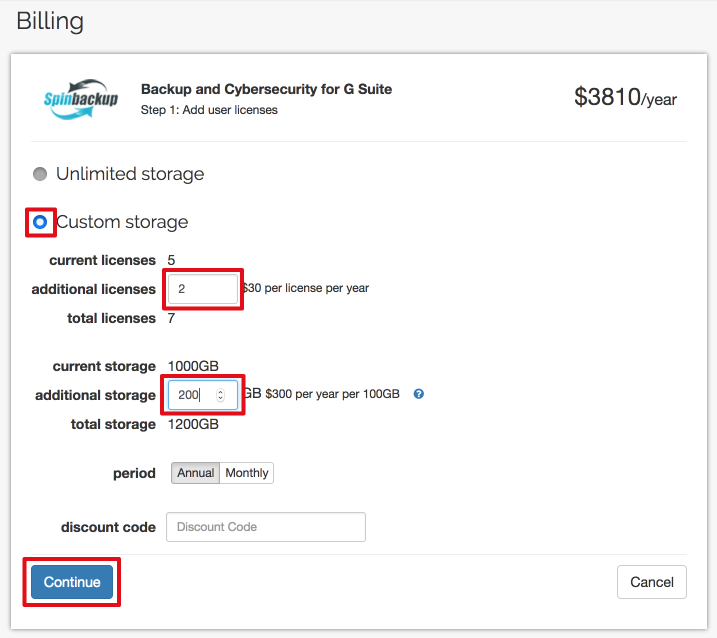 For Unlimited storage, select the number of licenses. Minimum amount is 5 licenses. By default, you take annual subscription. For purchases over $100 per month you can select monthly subscription by clicking on the Monthly button. Then press Continue. 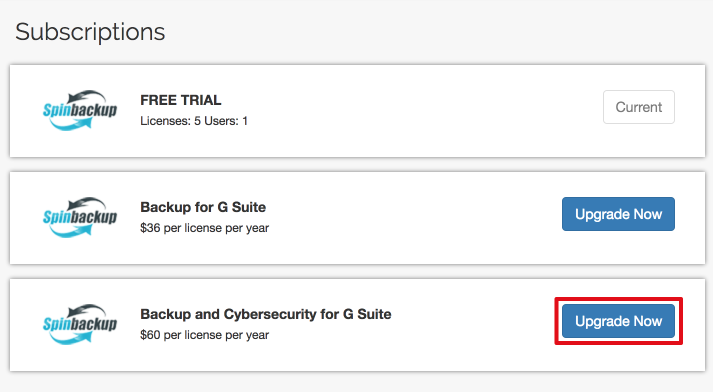 1 license = 1 G Suite account OR 1 Team DriveFor example, if you have 5 users in your domain and 2 Team Drives and want to back up them all, you need 5 + 2 = 7 licenses. Enter the amount of licenses and the required storage (minimum 5 licenses, minimum 1 TB storage) and press Continue. 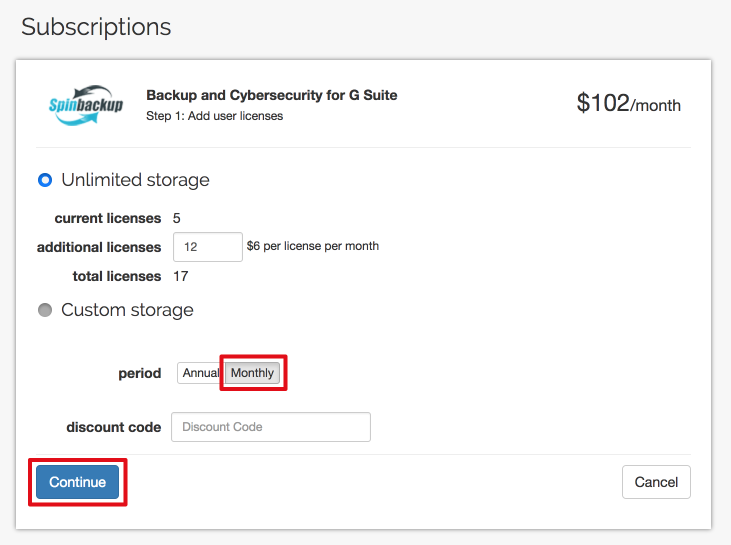 With Custom storage you are always able to select monthly subscription. 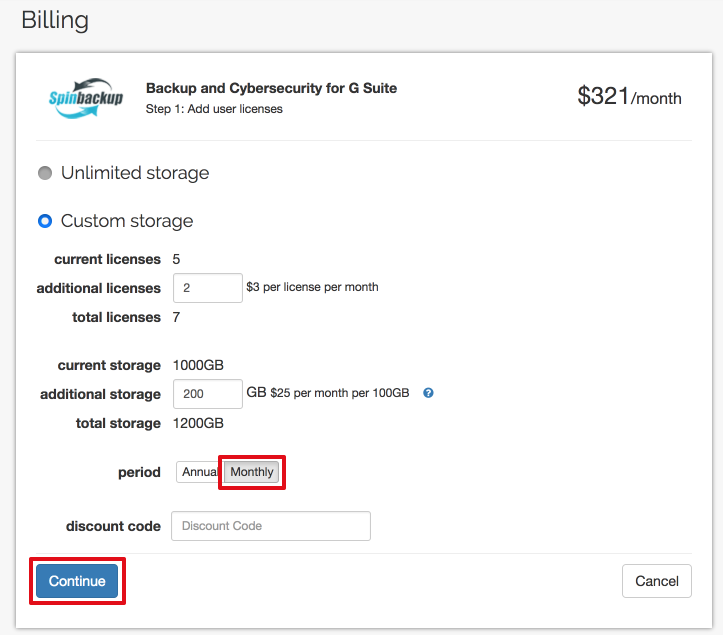 Please note: The storage you need at Spinbackup is always more than the storage you use at G Suite. This happens because Spinbackup makes incremental backup of your account, i.e. with every new version of your account, the new data is backed up, and nothing is deleted. Thanks to this, you can use the benefits of our Restore-in-time machine and Version control when restoring data. 6. You will be able to manage your licenses and/or storage any time in the future. At your menu on the left go to the Settings section. In the Account summary board you can see the number of licenses you have bought. You can press Add more to buy more licenses. In the Users line you can see the amount of users, assigned to the licenses you have bought. You can assign new users, if you have available licenses, by pressing the Add more button. In the Storage line you can see the amount of storage used and the amount of storage you have bought. Press Add more to buy additional storage. 7. If you want to change your plan from Unlimited to Custom or vice versa, please write a letter to our Support team. Press on your photo in the upper-right corner and then click Support.